Governor Larry Hogan today announced proposals, including new legislation, to ensure that the will of Maryland citizens is upheld in any legislative action impacting the start date of the school year, amid legislative efforts to undermine the governor’s executive order requiring Maryland public schools to begin classes after Labor Day. In 2013, following years of public pressure to return to a traditional school calendar, the Maryland General Assembly voted by an overwhelming 170-7 margin to pass legislation creating a state commission to study moving the school start date to after Labor Day, which was signed into law by former Governor Martin O’Malley. Public polling has consistently indicated that approximately 70 percent of Marylanders support this initiative, with under 20 percent in opposition. The task force, appointed by the former governor, included legislators, the state superintendent of schools, representatives of local school systems, local teachers, representatives of the teachers union, parents, students, and members of Maryland’s small business community. Following a year of research, hearings, and evaluating expert testimony, the commission voted in favor of starting school after Labor Day by a 12-3 majority. This initiative had the vocal support of former Governor O’Malley, who stated his intention to sign an executive order, as well as legislative leaders including Senate President Mike Miller. 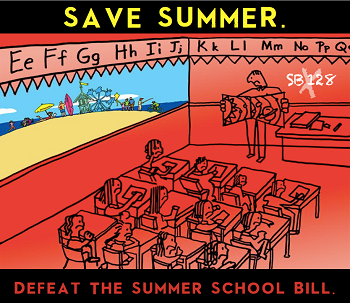 From 2013 to 2016, a total of five bills were introduced to require starting school after Labor Day, sponsored by dozens in both parties – including 16 Democratic legislators currently in office – which failed to pass, in large part due to pressure from teachers’ union operatives. In September 2016, Governor Hogan signed an executive order to finally enact the recommendation of the legislative task force and the will of Marylanders and require school calendars to start classes after Labor Day beginning in the 2017-18 school year. The executive order includes waiver provisions allowing school districts to apply for exemptions under certain circumstances, and the governor signed legislation in the 2018 legislative session to allow for additional flexibility for inclement weather days. The executive order maintains the required number of instructional days for students at 180 days and gives local school systems the full ability to set their own academic calendar. However, legislation currently being debated in the Maryland Senate (Senate Bill 128) would turn back the clock on this common sense action, allowing unelected bureaucrats in local school systems to determine the start and end dates of the school year and potentially thwart the will of citizens and taxpayers. Governor Hogan announced that the administration will submit legislation to codify the executive order requiring school to start after Labor Day in statute. If a local school system opts to move their start date earlier, the bill will require a jurisdiction-wide ballot referendum that must be approved by the voters, offering genuine local control to the citizens over this important issue. The governor also announced that if the legislature does not work in a bipartisan manner to pass the administration’s compromise bill and instead moves forward with SB 128, he will lead an effort to petition the bill to a referendum, which would place the matter on the statewide ballot for the citizens of Maryland to decide. “Marylanders will have the deciding vote on this one way or another, and there is absolutely no question about where they stand on this issue,” said the governor.